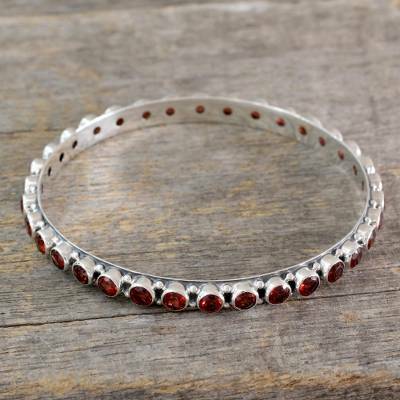 15-carat Garnet Fair Trade Silver Bangle Bracelet from India, "Love's Energy"
Garnet, gem of love and passion, shares its crimson energy in the cheerful design of this bangle from India. From Bhavesh, the sterling silver bracelet is crafted with a high polished finish and 15 gemstone carats. You can find garnet bangle bracelet 'Love's Energy' by Bhavesh in jewelry categories such as Bollywood Bracelets, Garnet Bracelets, Sterling Silver Bracelets and Bangle Bracelets. Enjoy exploring these sections for other Novica treasures.